We have over 250 companies in Australia and New Zealand using Cognology talent management software. 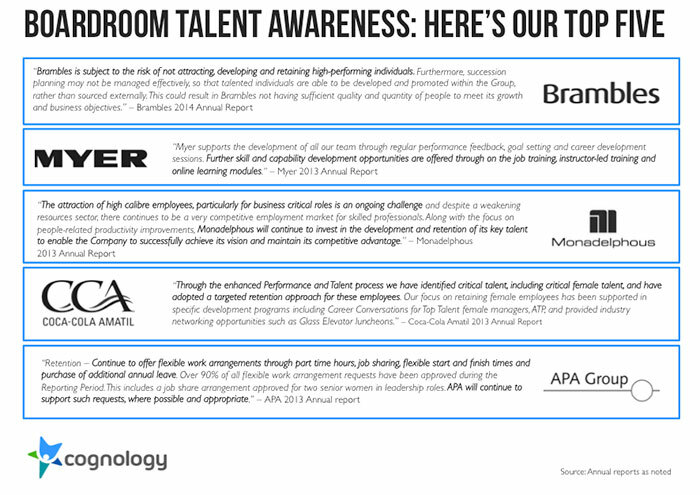 This gives us a rich source of data on the underlying trends in talent and performance management across the Australian workforce. Whilst there’s a lot of great opinion pieces and blogs about the changing workforce (we highlighted some of the best here), the discussion is often missing hard data about what’s really changing in the workforce. We’re aiming to change all that by jumping deep into our anonymised dataset on performance management. I want to make it clear that we’re looking at this data on a completely anonymous basis. No clients or employees are ever identified by our research team. And we’ll only use sample sizes where there’s no potential for any company or individual to be identified. In this article, we’re looking at the average span of control. From a personal perspective, managing a team has been one of the most complex and rewarding experiences of my working career. There’s no better feeling than being able to coordinate a team of people towards a shared goal, and seeing all that time and effort pay off. It’s immensely fulfilling, but it’s also an incredibly demanding task that’s hard to do well. And it gets harder the more employees you try and manage. Since the GFC we’ve seen multiple large cuts to middle management. So I wanted to understand what impact these cuts have had on the average span of control. Are we seeing managers stretched further and further? Here’s what we found by analysing the data in a number of ways. Teams are getting bigger. 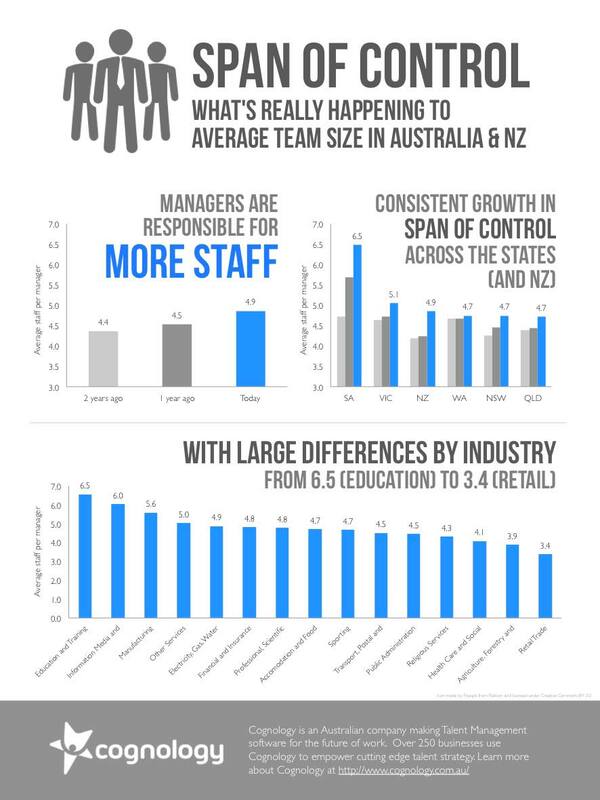 Over the past two years we’ve moved from the average manager being responsible for about 4.4 employees to 4.9. This increase of half an employee per manager (on average) is a pretty substantial increase. The interesting question to ponder is how is this increase is affecting managers and their employees. The good news is that we’ve looked hard and we’re not seeing any decrease in the quality or quantity of performance reviews as a result of this increase in responsibilities. This poses an interesting question: Is it just that managers are working harder, or are we also getting more effective at the same time? What I think is a strong possibility here is that managers are becoming more efficient through better technology and collaboration. Social technology makes communication with employees easier than ever before. Feedback loops become tighter, employees can share feedback with each other, and knowledge has now become a shared resource. Combine this together and it becomes easier to measure the performance of each individual, making management more effective. However we know that the capacity to manage well isn’t unlimited. And clearly this average hides some big variation in team size under the surface. There’s a bunch of managers with 1-2 direct reports. And then there’s also many with 10+ team sizes. And whilst we do see the occasional manager with 20+ employees in our dataset, thankfully they’re not that common. Any one with direct management responsibility knows just how much time and effort it takes to manage employees well. Could you really expect a manager to properly measure the output of 30 employees? And I mean properly manage them; having the ongoing conversation, knowing the career aspirations, strengths, weaknesses, and driving the growth of 30 employees. You just don’t have enough time in the week to properly manage that many employees. We know what’s happening to the average span of control, but what’s the right span of control? I’ve always said that you should be able to make 45 minutes every day for each team member that you manage. It takes a lot of time to do people management well. You have to allow for this time commitment (as well as all your other responsibilities) when setting appropriate team sizes. 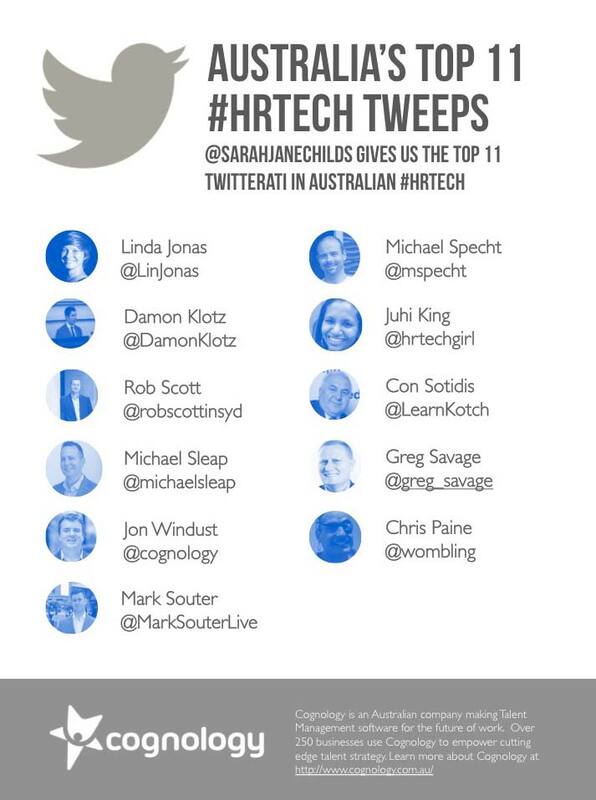 What other workforce trends would you like us to explore? We’re keen to dig into anonymised performance data in as many ways as we can. If you’ve got questions about the Australian workforce that you’d like to see us explore on this blog, please comment below or tweet to us via twitter @cognology. In the case that we publish research based on your idea, we’ll look after you with some great prize packs featuring our selection of the best Management and HR books of 2014. Through my work at Cognology I spend most of my life thinking about talent management and employee risk. But I wanted to understand how much time other Australian CEOs and CFOs spend thinking about their key employee and people risks. So with my team of helpers here at Cognology HQ we’ve spent the past few weeks investigating how the largest companies in Australia recognise people risks. To do this, we compiled the most recent annual reports for each of the ASX 100 (the largest 100 companies in Australia). We were looking at the section where each of these companies declare key business and investment risks. Broadly, this section is meant to describe all the critical risks that investors need to think about when choosing whether to invest money into the company or not. We wanted to see which companies recognised people as a key business risk – and which didn’t. I suspected we’d get some variance, and that we’d find some outliers who ignored their people all together. But the truth was more astounding. It’s worth remembering here that we’re dealing with the 100 largest, most sophisticated companies in Australia. And when documenting their key business risks, just half declare ANY key business risk that’s related to their employees. 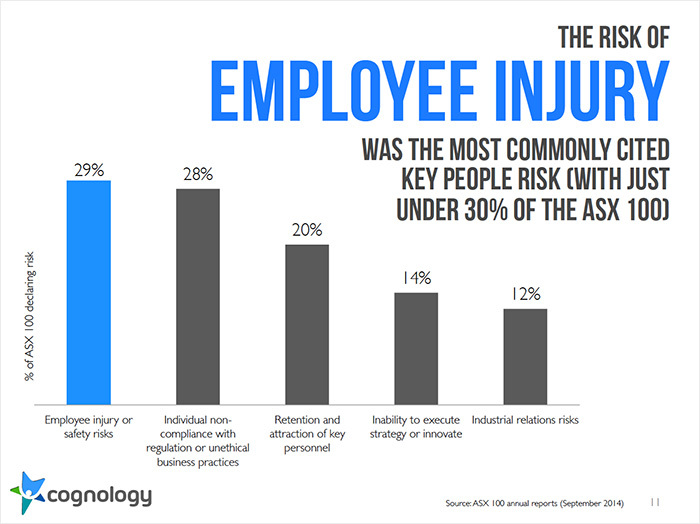 Just 50% of ASX Top 100 listed companies mention ANY employee related risk in the key business risks section of their latest annual report. Remember that companies are required to disclose all key business risks to investors. And we’re talking about Australia’s largest and most sophisticated organisations. Yet people risks receive no mention at all for half of these companies. I’d argue that for just about all of these companies, people are the most complex and unpredictable single part of the business. Which is exactly why I believe that people are the most valuable resource, and the biggest risk, to any organization. We’ll get back to my talent rant in a minute – but first some more context around the data. Non-compliance with regulation or unethical practice. For example from Woolworths 2013 Annual Report: “There is a risk of non-compliance with, or additional obligations relating to, legal and regulatory obligations and expectations which may have a negative impact on Woolworths’ performance”. Just under a third of the largest companies in Australia mention employee safety and injury as a key business risk. It’s quite incredible just how many companies (especially in the resources sector) open up the annual report by stating: “safety is our #1 priority”, but then completely ignore safety in the key investment/business risks. Of the other people risks, “non-compliance” was the second most common, followed by “retention and attraction of key personnel” and “Inability to execute strategy or innovate”. “Industrial relations risks” were least commonly cited, with just over 1 in 10 companies describing this risk in their annual report. 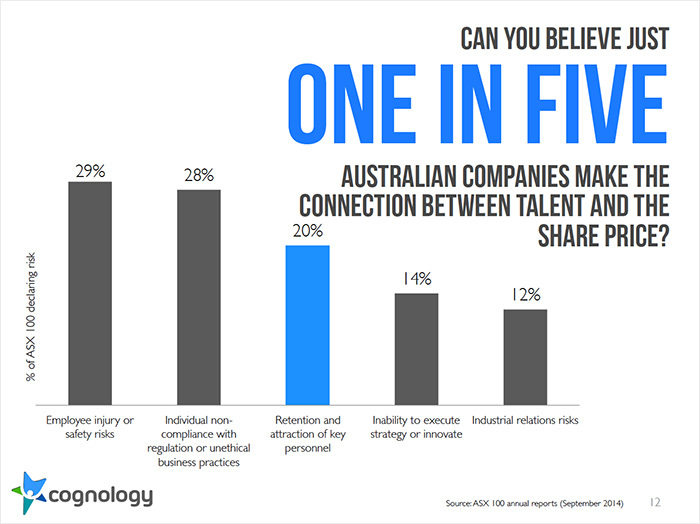 Only one in five companies makes the connection between talent and the share price! I was shocked that “retention and attraction of key personnel” is cited by just one in five companies. I simply can’t believe this – based on the HR departments I’m talking to, this is a key concern for nearly 100% of large Australian companies. As these CHRO’s know, there’s a real war for top talent (whether that means building it or buying it). But clearly the CFO is struggling to make the connection to the impact on the share price. 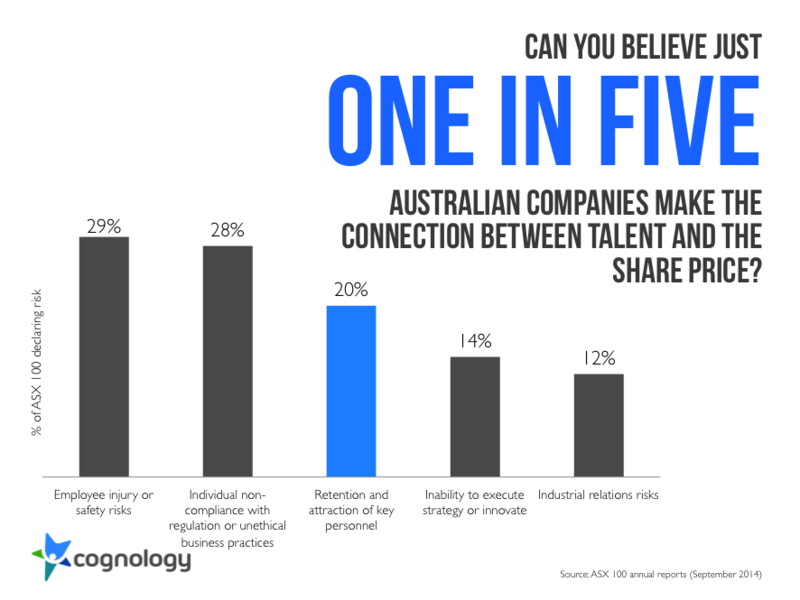 So maybe the alternative way we should present this stat is: “only one in five Australian CFOs recognizes the risk of poor talent management on the future share price”. People are the most valuable resource (and the biggest risk) to any company. I’m still astounded by these results. Based on the large number of Australian companies who ignore people risk, I’m left wondering if some of these companies are secretly run by robots? That said, I can understand how this happens. The CFO and the lawyers sit around in a room brainstorming investment risks. And they probably copy and paste from last year’s report most of the time. But, why I’m so concerned is failure to recognize a risk is failure to plan for the risk. Because for most of these companies – talent and people are by far the biggest risk to the future share price. And perpetuating the illusion to shareholders that people are “all under control” is a massive mistake. Personally, I’m looking forward to the day when the ASX makes it mandatory to report on your talent management strategy. I think it will be a great win for investors, and force CFOs to confront the talent challenge from a dollars and cents perspective. And I have no doubt that over the next 15 years we’ll see it happen. But we’ve got a long way to go yet. And getting more than one in five of the largest, most sophisticated companies in Australia to recognize the direct connection between attracting and retaining key people and the future share price is the first step. When I look through the ASX 100 annual reports next year I hope to see more declarations of people risks. I’m also looking forward to monitoring the 50% of companies that don’t declare people risks. You can bet they’ll struggle in the coming years if the perspective in the c-suite doesn’t change. And finally, make sure you stay tuned to the Cognology blog – we’ll release more detail from this research including an industry-by-industry breakdown over the coming weeks. Any guesses on how your industry shapes up? This data uses the latest annual report publically available on the company website as at late September 2014.